Recent articles focusing on 3A certified industrial basket strainers demonstrated their importance in food processing, ice cream and cosmetic production, the dairy industry, and flavor creation. 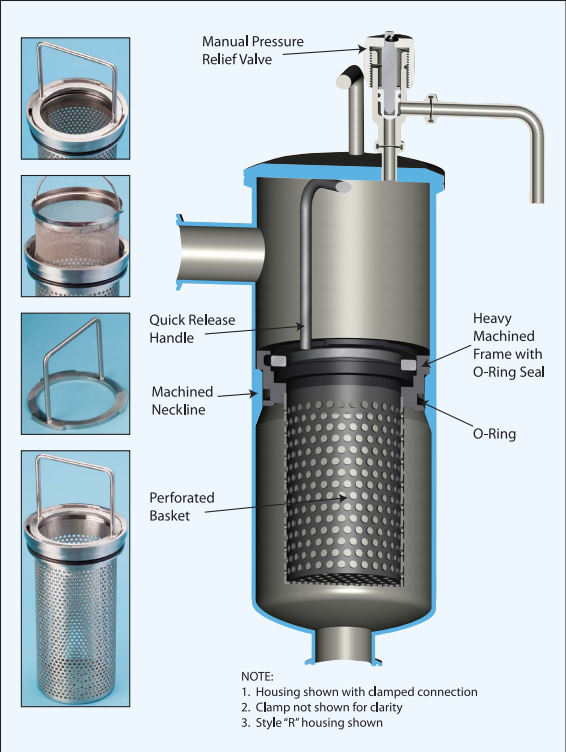 Now the versatility, capability and features of SaniClean Strainers™ basket strainers are highlighted in this general overview, along with several available equipment options. What fluid is being processed? If the processed liquid has a high solid content, an industrial strainer basket with a greater area should be considered for longer run time between cleanings. Selecting the wrong sized basket strainer may lead to clogging and backup issues in the production stream. Ease of installation and removal is one of the key features on all SaniClean basket strainers, and they have been engineered with two different handle options: a quick release handle or an integrated round rod handle for lower costs and simpler installations. As previously mentioned, SaniClean basket strainers are widely used in the food, beverage, pharmaceutical and other high-quality processing applications. SaniClean Strainers, a Newark Wire brand and a top manufacturer in the industry, manufactures a complete line of wire cloth and industrial 3A certified strainers, inline strainers, baskets, basket strainer filters, assemblies, replacement parts, and filter media suitable for a wide range of applications and capacities. Contact them today and get their products and expertise working for your next filtration project.